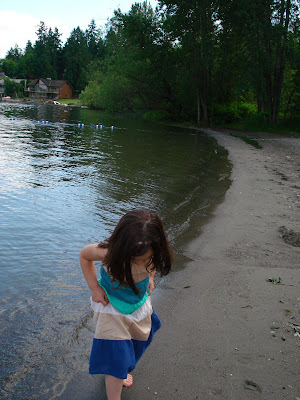 Yesterday we visited a beach on a lake near where our grandchildren live in Washington. The weather was sunny but a little chill was in the air. It didn't stop several kids who were in bathing suits from wading waist deep into the cold water. I shivered to watch. What was truly fascinating however was the international beach project that took shape in a matter of minutes. I say international because there were Asian, Hispanic, Caucasian, and Indian children involved in the rather spontaneous construction of a river that began at the edge of the grass and ran through the sand about 50 feet to the lake. Several children started the dig and curiosity drew others. As the project escalated, some became dredgers, some supplied water (they owned buckets), and still others banked the sides to keep the water from flooding over. One enterprising young lady formed a square with her fingers and proceded to interview the others on the project. Questions such as "What is the importance of this river?" were tossed at the workers who answered with surprisingly intelligent responses like, "It will help the lake." One young boy must have been the ecologist of the group as he shooed the ducks away to keep the project from injuring them. The ducks obviously thought it was a feeding trough. As the dozen or so children worked for a good hour on keeping the river running, I saw what gives us hope for our future--young people who can come together and work so well to "improve" the beach will certainly grow into adults with the same capabilities to improve our world. I pray no one spoils their enthusiasm.